« Cancelled! 12 – 1:30pm YIN Yoga + Reiki…TOGETHER! Cancelled! Advanced Reiki Training is a workshop for Reiki students who have taken Reiki 2 at least 6 months prior, who practice Reiki regularly, and who desire a more in-depth study of Reiki techniques and meditations. In short, it’s for those students of Reiki who want to deepen their practice. Advanced Reiki Training (ART), can be taken alone, without the Master Class, for those who want to learn the Master Level symbols and take the next step in Reiki, including the attunement, but don’t want to teach Reiki at this time. It is given as a full day class/workshop, and is a prerequisite to the Reiki Master Class, which is given the following week. ART is a very fun and informative class, with lots of hands-on practice, and a wonderful attunement, which opens the student to higher-level Reiki frequencies. Both this class and the Master class are deeply healing, and combining the two classes is a double blessing. 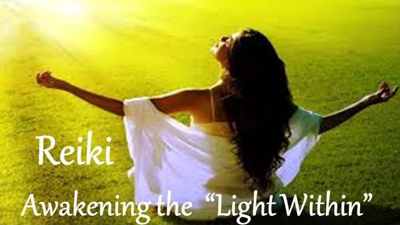 The package enables you to complete the Usui Reiki Training and Certification Program offered by Open Hands Reiki. Most students take both together. Pre-registration is required! Click HERE to save your spot! If this class is taken alone, the price is $250. The combined cost for this class plus the Reiki Master Class on the following Saturday, is $450. This Advanced Reiki Training class is a prerequisite for the Reiki Master Class. An ART manual is included, unless you register for both classes. In the latter case, you will receive the Reiki Master Manual. Again, the prerequisite for Advanced Reiki Training is that you have taken a Reiki 2 class at least 6 months prior and that you practice Reiki regularly. A questionnaire is attached to the Registration site, so that you can tell me your qualifications and why you want to move forward in your Reiki path to this advanced level. Thank you! Maureen Rivelle is a retired RN and active Reiki Master! She has been practicing Reiki daily on herself, her family, friends, and animals, for the past 12 years and has been blessed to be a part of many healings: physical, emotional and spiritual. Her practice, Open Hands Reiki, is located at Daylight Healing Center in Edmonds, WA., where she, and other providers, offer ongoing events. Maureen belongs to the Reiki Healing Association. Visit her Facebook page, Yelp and Google reviews under Open Hands Reiki, and her blog. She’d love to share her passion for Reiki and healing with you and hopes to see you in class!